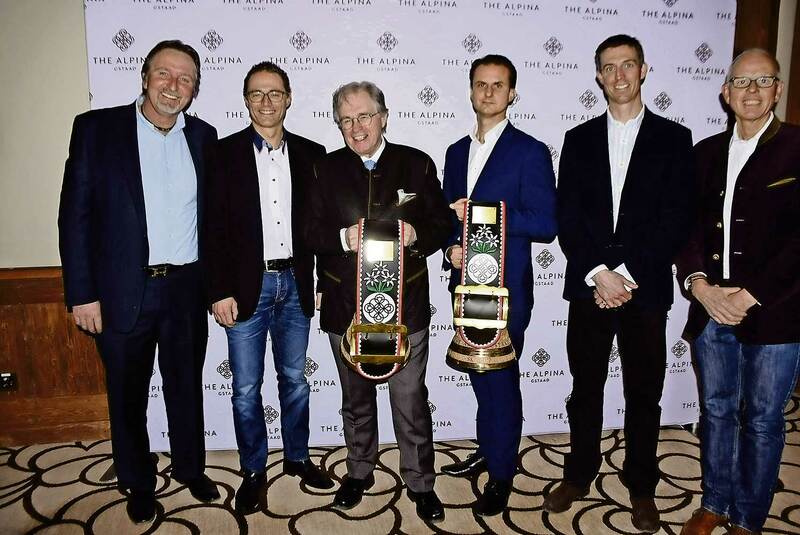 With all eyes on The Alpina Cup, the event comprised a slalom race at the Wasserngrat and an evening hockey match between two very competitive teams on the Gstaad ice rink. This time, it was really close. 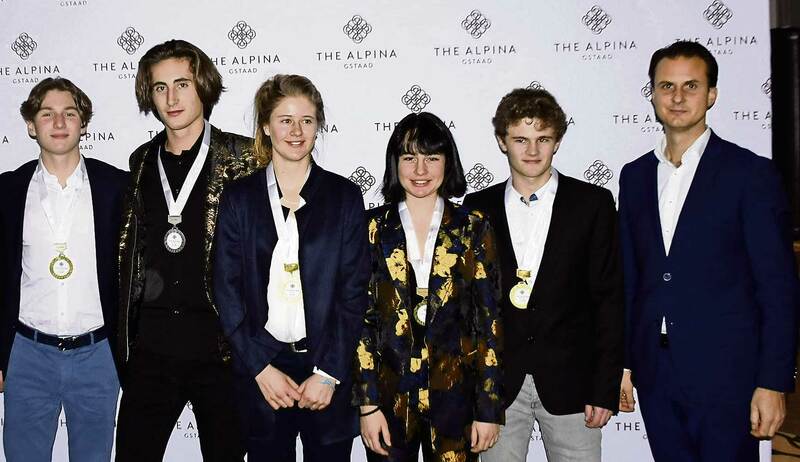 At the end of January, the two schools Gymnasium Gstaad and the Institut Le Rosey competed in winter sporting events at the seventh edition of The Alpina Cup, which has become a spectacular tradition. Pupils and teachers from both schools did their best at skiing and ice hockey. “It’s awfully cold,” said one student, shivering behind the starting gate. In addition, more than 50 of his classmates, guests and teachers were battling it out for the fastest times. Conditions on and around the race track were absolutely fantastic. The sun shone down from a deep blue sky. Nevertheless, the air had a real bite with the cold, helping the piste to keep its grip for the final skiers. A good mix of skiers and snowboarders were out there for the start of the giant slalom. Some tried to find a sunny spot to wait in. Others jumped up and down to fight the cold and their nerves. They motivated one other, no matter which team they belonged to and there were no signs of any language barriers. Pupils from the top forms of Gymnasium Gstaad included skiers with competitive and racing experience. Accordingly, the fastest local high school girls didn’t let anyone get the better of them and took the first five places in their category. Competitive athlete Julie set the best time of the day. She’s been very successful in collecting FIS (international ski federation) points this season. In second place was Jasmine, followed by Jessica. Places 4 and 5 were also secured by Gstaad pupils, thanks to Marion and Michelle. In the boy’s categories, Michael scooped top position for Gstaad. However, the competition from Le Rosey was hot on his heels. Louis and Hadrien took the other podium spots. Sarah from Gstaad High School won the snowboard competition, followed by her schoolmate, Felix. Amateur ski students didn’t disappoint either, kicking up the snow and displaying spectacular manoeuvers as they passed through the gates. “Too direct an approach,” said one of the few skiers who dropped out, giving the televised commentary. As a group of schoolgirls made their way through the gates, their priority was to safely cross the finish line. “I’m aiming to be tucked up snug in my bed tonight,” said one of the skiers when asked about her aim. The course was set by racing boss and teacher at Le Rosey Patrick Zürcher. It was demanding but not overly challenging. Commentators Joannah Spencer and Christoph Däpp, who represented both schools, delivered a bilingual race report as the girls and boys, guests and teachers from both schools crossed the finish line. As the sun started to set, participants made their way down to Gstaad, where the ice hockey match kicked off on time. Some lingered long enough to get changed and then went on to spectate, dotted around the edge of the ice rink with waffles and punch, courtesy of the main sponsor, The Alpina Gstaad. Temperatures dropped well below zero. The cold and its icy nip took many of the spectators by surprise and the two judges, Nils Kunz and Marco Romang, rubbed their chilly hands. However, the players on the ice rink were starting to sweat. A team of high school students, seniors and novices from the Gstaad-Saanenland hockey club got the match off to an explosive start. They were quick to score goals, crushing their opponent, Le Rosey. Teachers, students and guests from the opposing team were no match for the locals. Taking a clear 6-2 lead with the first third of the match gone, the Gstaad ice hockey players thought they were safe. Demoralised by the sudden onslaught of shots raining down on the goal in the first few minutes, the team Le Rosey goal keeper roared in anger. This seemed to have an effect and, in the second third, spectators enjoyed a more balanced match. In the final third, not only did Le Rosey launch a counter-attack against the full-on play they’d been met with, but they even scored a goal to take the lead. The Gstaad team equalised literally in the last minute. The match ended in a 12-12 dead heat. In the end, there was a draw to pick the match winner and the Gstaad team came out on top. The best hockey player of the day on the Saanenland side was Raphael. For team Le Rosey, the nomination went to Hadrien. A successful day of sporting events was followed by a triumphant finale, with a joint dinner at The Alpina Gstaad. Once nice and warm inside, the pupils, students, guests and teachers chatted about the day’s events, with exciting discussions and lively exchange taking place. Rob Gray also commented on the valuable connection between the educational institute and Gstaad: “We often ask ourselves if our pupils get something out of coming to Gstaad for just nine weeks of the year,” said Gray at the start, before answering: “They certainly do, because Gstaad is a special place. The connection in Gstaad between Le Rosey and the locals is far stronger than in Rolle, the institute’s headquarters.” Everyone feels very connected to the Saanen region. “It’s like a love affair,” he said, describing the relationship between Le Rosey and Gstaad. “So, let’s carry on.” As part of this, The Alpina Cup is a permanent fixture and an extremely positive event.